After Jen left on Sunday morning, I was ready to detox my body. No more Sir Pizza, no more booze, and no more dessert (by the way, I had the most ridiculous Chocolate Lava Cake with Ice Cream at Segafredos in Brickell, after dinner at Perricones! Delicious!) But just as I was planning out my menu of healthy salads for the week, I remembered that I had a date! I figured, after an entire weekend of binge eating, what’s one more night of unhealthy food? Of course, I could have always just ordered a salad on the date, but that is just so boring and since I am clearly not the kind of girl that has a problem eating in front of guys, I knew that I would end up eating a full three course meal. So I showered up, got dressed, and headed downstairs to meet him. I will leave him nameless for the sake of discretion (can’t blog all the details)…all that you need to know is that the date went very well and that he is a good-looking, funny, and great guy. When I got into the car, he told me that we were going to Michael’s Genuine Food and Drink in the Design District and I instantly lit up like a Christmas tree! I had been trying to get to Michael’s for several months now and it always seems to fall through, but tonight I was finally getting to go! He started earning brownie points with me from the very start. We started off with a great bottle of red wine and then got to ordering our appetizers. He took control (which I gladly gave over) and ordered two different small plates for us to share. 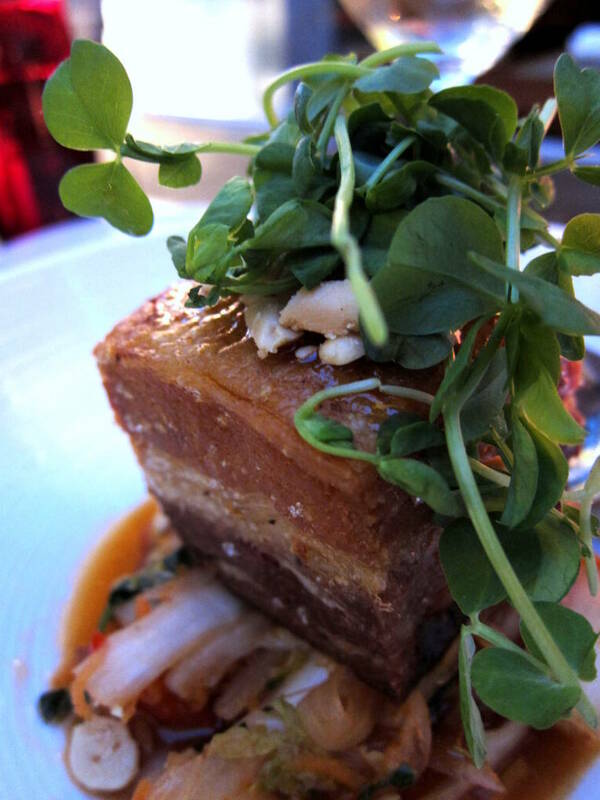 I always find it fun when someone else places the order because I get to try things that I wouldn’t normally pick off the menu for myself…and he picked something I wouldn’t order ever—Crispy Sweet and Spicy Pork Belly with kimchi, crushed peanuts, and pea shoots. 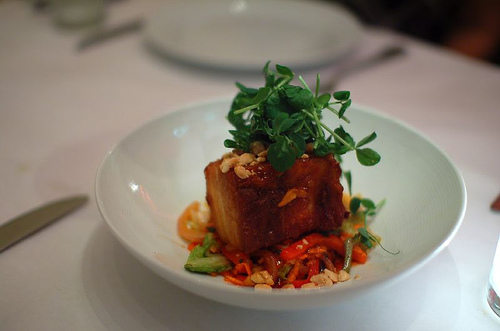 I had never tried pork belly before, and thought I could live the rest of my life happily without ever doing so. I was wrong! I was still not sold on the idea of it when the plate came to the table, and I only put a tiny piece on my fork to try, but I was back for seconds and thirds after that little nibble. The pork belly was cooked to perfection with a nice crispy exterior and a softer—but not fatty tasting—interior. I thought I was going to hate the texture because I gag on fatty parts of steak, but it really didn’t taste like that at all. The flavor was absolutely incredible with a tangy-sweet glaze that was complimented by all of the other elements on the plate. The kimchi was great and the peanuts added a nice crunch to the soft interior texture of the pork belly. This is the must order appetizer from Michael’s in my opinion and I thought it was the star of our entire meal. The second appetizer that we got the Local Heirloom Tomato and Avocado Salad with red onion, celery, and meyer lemon vinaigrette. This was really delicious because all the produce was fresh and ripe, but it was far outshined by the pork belly. Greasy and fatty always trumps healthy and light. 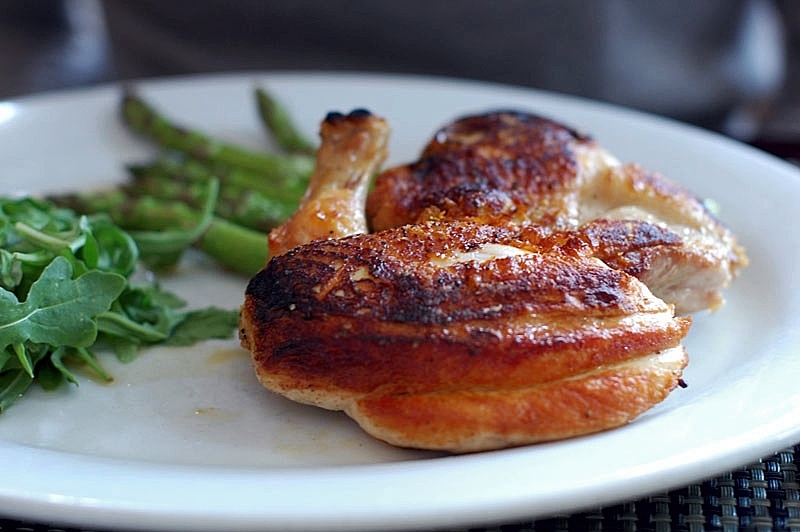 As an entrée, I ordered the Pan Roasted ½ “Poulet Rouge” Chicken with roasted garlic mashed potatoes and escarole. This was my attempt at ordering light…yes, you can laugh at that. The chicken was well flavored with herbs, but there wasn’t enough white meat for my liking. I wanted to keep eating more because the flavor was so good but once the white meat was all gone, I gave it up. The mashed potatoes were among the best that I have ever had. The garlic flavor wasn’t very pronounced but the texture was spot on—super creamy yet still a firm consistency. The escarole, which I was hesitant about, turned out to be fabulous. I have never enjoyed cooked out escarole before (only in soups), but Michael’s flavored it so well that it tasted better than sautéed spinach. It was fabulous and I put a little on the fork with every bite. My date ordered a Wood Oven Pizza with bacon, arugala, caramelized onions, and fresh mozzarella. It looked very good, although I did not taste it. I am pretty sure that Michael’s switches up their pizza on a regular basis, so this might not be on the menu when you go, but the pizza looked great. 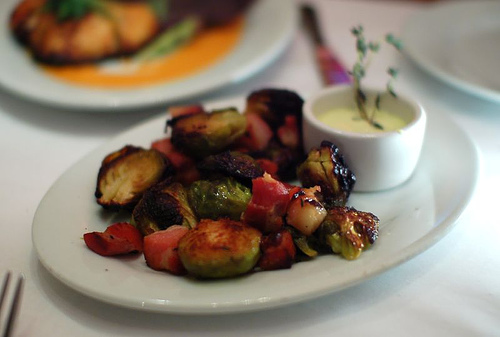 Ohh, and for a side dish we ordered the Brussels Sprouts cooked with Pancetta and served with a Lemon Aioli. These brussel sprouts were out of this world. I was actually moaning over them and felt bad because I definitely wasn’t doing an even share on them. The pancetta added a wonderful smoky flavor and the citrus from lemon aioli helped to cut the fat of the pancetta. Everything just paired together beautifully, and I would certainly suggest ordering these al la carte any menu item. Instead of ordering dessert at Michael’s, we decided that a change of scenery would be nice and so we headed to the Grove for something sweet at Jaguar. We ordered the Bread Pudding 3 Leches, which is a classic bread pudding and moist tres leches with a hint of cinnamon, a splash of rum, and caramelized carrots on the top. It was out of this world! I thought it tasted like a carrot cake combined with bread pudding and I was in heaven. I do hear that Michael’s has some of the best desserts, however, and so I would like to order one next time! An affiliate established fact by them advertisement should they see one. I do not even know how I ended up here, but I thought thiss post was great. President Obama,my husbadn and i have struggled from absolutely nothing to having just a home,we lost it,but,what i want to know is are you ever going to help the dept. of corrections family ever get our 15% back,we are now back where we started 23 years ago,and have no family to help us,we have 2 kids and cant even give our boy a college education,yet aliens get everything for free,free gas,free room and board,free foodstamps everythingf,and those of us who have worked hard we get nothing and our children get nothing! no wonder america is going down the tubes,whos going to be educated to run this country,left over movie stars? come on,my husband retires in 4 years,hes worked out,our son wants to go to college,but hell have to pay any loans back,so hes shot before he starts,yet others who are on welfare and just use the system get everything for free,they wear brand name shoes and always have plenty of drugs and they have kids so they can get free housing and food and cash,and free medical,we who work just keep getting slashed on the back,work harder and longer so we can keep giving to the lazies who are running our welfare in the ground,my grandpas and brother and uncle fought for this country and our children get nothing!absolutely nothing all because my husband has a job! !maybe he should go on welfare or we should get a divorce so i could go live off the system and get my son a free college education! why not give us our 15% back,we lost our home because of arnold schwarzennegar,and now he wants more,we will fold if he gets it,can u help!just give us our 15% back,please!! !